Please note that titanium handles are only interchangeable with titanium tips and stainless handles are only interchangeable with stainless tips. Replacement O-ring sets are also available for both stainless and titanium products. Please note that silicone sleeves are not included with tips. Coaxial I/A tip with straight shaft and tip. 0.5mm dual sideport aspiration and 16g irrigation sleeve. Titanium, 21g, coaxial I/A tip with straight shaft and tip. 0.3mm dual sideport aspiration. Made for use with silicone irrigation sleeve (sold separately). 21g, coaxial I/A tip with straight shaft and tip. 0.3mm dual sideport aspiration. Made for use with silicone irrigation sleeve (sold separately). Coaxial I/A tip with straight shaft and tip. 0.3mm dual sideport aspiration and 16g irrigation sleeve. Titanium, coaxial I/A tip with straight shaft and tip. 0.3mm dual sideport aspiration and 16g irrigation sleeve. Coaxial I/A tip with curved shaft and straight tip. 0.3mm dual sideport aspiration and 16g irrigation sleeve. Titanium, coaxial I/A tip with curved shaft and straight tip. 0.3mm dual sideport aspiration and 16g irrigation sleeve. Coaxial I/A tip with curved shaft and straight tip. 0.5mm dual sideport aspiration and 16g irrigation sleeve. Titanium, coaxial I/A tip with curved shaft and straight tip. 0.5mm dual sideport aspiration and 16g irrigation sleeve. 21g coaxial I/A tip with curved shaft and tip. 0.3mm dual sideport aspiration. Made for use with silicone irrigation sleeve (sold separately). Titanium, 21g, coaxial I/A tip with curved shaft and tip. 0.3mm dual sideport aspiration. Made for use with silicone irrigation sleeve (sold separately). Coaxial I/A tip with straight shaft and 45-degree angled tip. 0.3mm dual sideport aspiration and 16g irrigation sleeve. Titanium, coaxial I/A tip with straight shaft and 45-degree angled tip. 0.3mm dual sideport aspiration and 16g irrigation sleeve. 21g, coaxial I/A tip with straight shaft and 45-degree angled tip. 0.3mm dual sideport aspiration. Made for use with silicone irrigation sleeve (sold separately). Titanium, 21g, coaxial I/A tip with straight shaft and 45-degree angled tip. 0.3mm dual sideport aspiration. Made for use with silicone irrigation sleeve (sold separately). 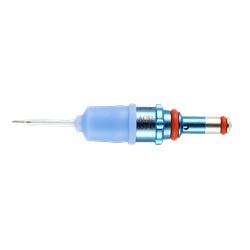 Coaxial I/A tip with straight shaft and 90-degree curved tip. 0.3mm dual sideport aspiration and 16g irrigation sleeve. Titanium, coaxial I/A tip with straight shaft and 90-degree curved tip. 0.3mm dual sideport aspiration and 16g irrigation sleeve. Coaxial I/A tip with straight shaft and 150-degree curved tip. 0.3mm dual sideport aspiration and 16g irrigation sleeve. Titanium, coaxial I/A tip with straight shaft and 150-degree curved tip. 0.3mm dual sideport aspiration and 16g irrigation sleeve.